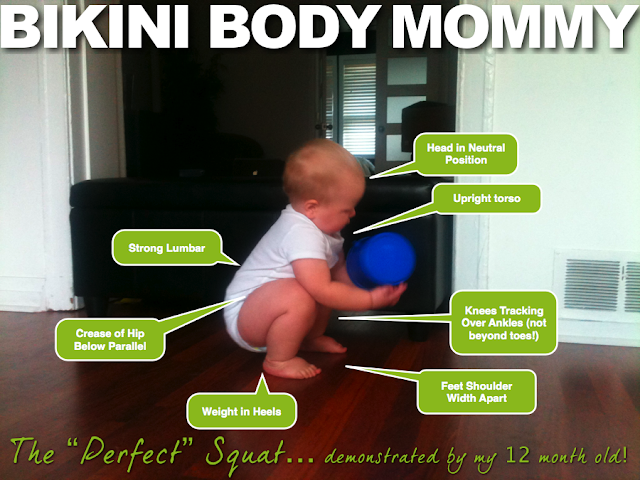 BIKINI BODY MOMMY™ — HAPPY SQUAT-ERDAY! He can't walk, but he CAN Squat! If my one year old can do it ... you can to! So I've decided to DUB this Saturday = SQUAT-erday! If you're up to the Bikini Body Mommy challenge, set your timers for 2 minutes, grab a chair, and try to preform as many squats (tapping the chair with your bum, or it doesn't count) as you can before the time goes off. Post your scores below or on FB afterwards.... Happy Squatting! Newer PostIF YOU REALLY KNEW ME.